LISBURN City Council recently held its annual wreath laying ceremony in memory of one of its Freemen, the late Major Frank Pantridge. Members of the Council, the Pantridge Trust and the National Malaya and Borneo Veterans Association (NMBVA) attended the ceremony at the Pantridge Memorial Statue at Lagan Valley Island. The Mayor, Alderman Paul Porter, said: "On behalf of the Council, I am proud to offtciate this ceremony in memory of Major Frank Pantridge and to remember all the brave heroes who served alongside him in Singapore. "Major Pantridge served in Singapore as a Regimental Medical Officer with the Gordon Highlanders and was awarded a Military Cross in 1942 for bravery while fighting the Japanese in Malaya during World War II. He survived his time in Japanese labour camps including the Siam-Burma railway and returned home to Hillsborough, never forgetting those brave soldiers he left behind." 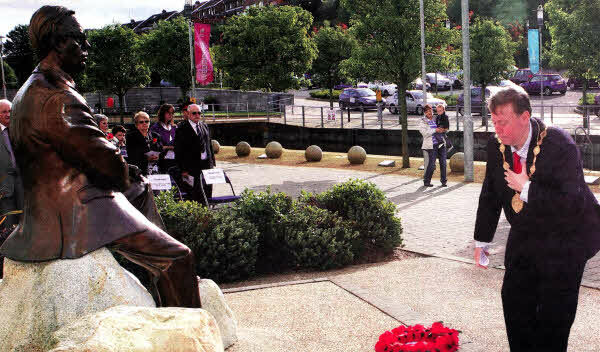 The Mayor laid a wreath at the base of the Pantridge Memorial Statue during the ceremony. The Mayor added: "Over recent years the Council has been very privileged to work with the NMBVA and the Pantridge Trust to remember those injured in action who Major Pantridge helped, those who died and the survivors of this regiment."